Ramachandi is one of the famous temple as well as one of the best picnic spot in Puri which is situated about 7kms from the Sun temple Konark and it is located on the marine drive road from Puri to Konark. Ramachandi is popularly beleived the presiding deity of Konark, and the most benevolent Chandi known. It is certainly more ancient than the Sun temple at Konark. 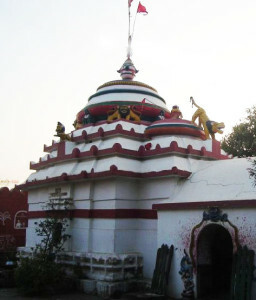 From the architectural point of view, the temple of Ramachandi is not important but from the religious point of view, it is one of the famous Sakti pithas of Puri. Goddess Chandi, seated on a lotus in a small temple half hidden by sand mounds, on the river mouth of ‘Kushabhadra’ and the endless Bay of Bengal stretched to eternity, and a thick growth of Casuarina plantation around is the scenic maginificence of the place. Before construction of the Marine drive road, the place was not accessable to out side visitors. However it attracted large number of local devotees to offer sacrifices ‘Bali’ in the month of Ashwna Picnicking at Ramachandi was then a youthful feat. The romantic sight has always fascinated young lovers, students and picnicking troups from far wide besides a handful of professional fisherman who exploit inhabitants. However after the construction of the Marine dive road, the place has become very easily accessable. We see regular crowd of pleasure seekers both from the neighbour hood and distant places every day. A legend regarding the deity is ever fresh and popular among the locals. “Kalapahada” the rebel Hindu Brahmin Youth turned islam, vowed to destroy all the temples of Hindu worship during 17th Contury. After destroying the Sun temple, Kalapahad approached to Ramachandi temple to destroy it. Then Goddess Ramachandi dressed as a Maluni (maid servant) asked Kalapahad to wait at the door till she bring water from the river for the Goddess. Kalapahad anxiously waited for a long time to get some cold water. When it was too late and the Maluni did not return he exhausted and entered inside the temple and found the throne empty. Then he thought the Maluni took away the deity with her and with anger he followed the Maluni. When he reached the bank of the Kushabhadra river he found the goddess Ramachandi floating in the middle of the river. At that time the river was outpouring, so he came back without able to reach the middle of the river. Then Goddess Ramachandi came in dream of a panda (priest) and told him to built a temple on the bank of the Kushabhadra river. This place is now known as Ramachandi. Through out the year many visitors come here to get the blessing of Goddess Ramachandi and to enjoy the scenic beauty of river Kushabhadra and Bay of Bengal. Give Responses for "Ramachandi Temple of Puri"